Tax laws can be complicated, and every store owner really should consult their tax attorneys before going big time, and probably before selling anything at all. 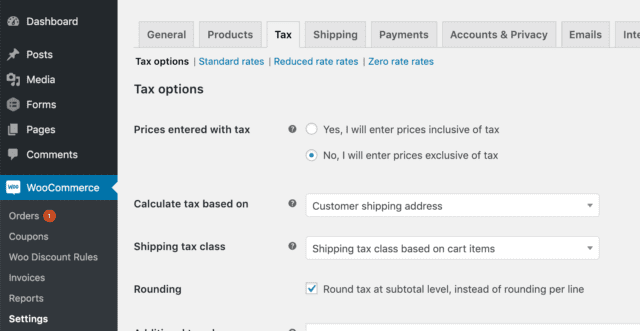 That said, I’m no tax lawyer, but as a lowly website designer and WordPress developer, I do know a thing or two about how to set these taxes up when using the absolutely awesome Woocommerce plugin to sell things on your website. First, let’s review what’s in Woocommerce by default. Once you’re in WordPress, and have Woocommerce installed, you’ll need to tell it you want to enable taxes. This is done via Woocommerce > Settings > General. Scroll down the page until you see this section, “Enable Taxes” and make sure the box is checked. Next, go to Woocommerce > Settings > Tax. The first “sub-tab” of this section of Woo’s settings is called Tax Options. Here’s what they all do. Choosing, “Yes, I will enter prices inclusive of tax” essentially voids all other options, as if you do this, you’ll effectively be dealing with taxes on your own — both when you create products and add their pricing as well as when you go to do your own taxes come tax time. Most people will choose, “No, I will enter prices exclusive of tax” and continue on through the process. Typically in the US, this should be set to “Customer shipping address.” That will tell Woocommerce to look at whatever shipping address the customer enters and base taxes off of that. So if you end up setting up a 6% Pennsylvania sales tax, for example, only users who live in Pennsylvania will be taxed that 6%. If you decide to add the 1% additional Allegheny sales tax, then people who live in that county (we set this all up later) will pay 6% PA tax + 1% Allegheny sales tax for a total of 7% tax. The other option is to charge tax based on your shop address. In Pennsylvania, for example, online stores with sales of $10,000 or more annually all must charge tax and pay it to the state. Otherwise, you’d leave them set to the normal rate. You can also set their Tax Status to None alternatively, if you don’t want certain items to be taxed. You can also choose whether specific products get their shipping taxed as well. Here you choose whether the prices shown on your site’s front end pages will show their price + tax or just the initial price. This is the same as the one above, but applies to the cart page. This allows you to add some text after the normal pricing. So if a product costs $19.99, you can add text here so that it displays as “$19.99 + tax” by literally entering the text “+ tax” here. Make sure to click Save Changes after you make any changes. Next up, click Standard Tax Rates near the top of the page. Click Insert Row to create a new taxation situation. We’ll do Pennsylvania and go through each box one at a time. This is where we’ll end up when we’re done. Every country has a specific code, and they’re all kept up to date here on Wikipedia. Pennsylvania is the US, so we’ll enter US in the first box. If you’re not in a country with a state or province code, you can leave this blank. Pennsylvania’s code is PA though, so we’ll add that here. Now, everything in the state will get the tax rate we set. You can use this to set even more limited regions. For example, if you want to apply the 1% sales tax applicable to Allegheny County, you can add all of the zip codes in that county here. I even have a list of them ready to roll for you here, should you be looking for Allegheny ZIP Codes. We don’t need that for now, though, and note that if you did want to add the 1% Allegheny sales tax, you’d want to click Insert Row and add it as its own line, since here we’re doing PA in general. Here you could add in a specific town or city, and if the customer types that in as their address, the tax class would apply to them. This is our tax rate. For PA, we’ll enter 6 here. This is what will be displayed on the front end of the site, if you’ve elected to show all taxes as one line. You can leave this at 1, but if you have multiple tax rates, they all need different numbers entered here. The total cost, with all compound tax, then becomes $21.41. Making our total price $21.40. This could very considerably more with larger tax percentages. Check this if the tax should apply to any shipping costs. You can add as many tax rates as you’d like here, making Woo’s built in taxation system completely sufficient for nearly any situation…though not necessarily easy to maintain with more than a few. If you know you have more complicated tax needs, you can look into paid services like the many Woocommerce tax add-ons, which can handle all of the many tax zones in the world for you.